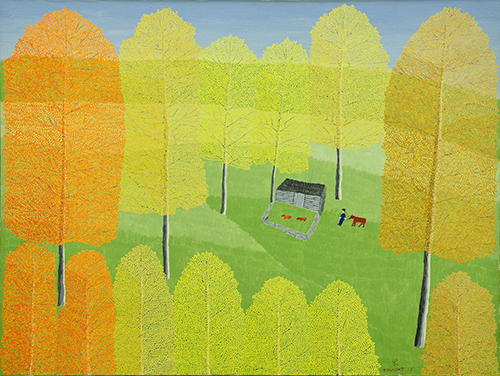 Theora Hamblett, a lifelong resident of Lafayette County, didn’t begin her career as an artist until the latter part of her life. Born in 1895 in Paris, Mississippi, Hamblett grew up on a chicken farm, which became the subject of many of her paintings. During the early decades of the twentieth century, she taught school, but by the 1930s, she left to care for her ill mother. After the passing of her mother, Hamblett moved to Oxford, where she bought a 12-room house on Van Buren Avenue. She rented rooms to University of Mississippi students and sewed to make money. In 1948, the University of Mississippi created its Department of Art and soon after, Hamblett took her first class in oil painting, at the age of 55. In addition to a few courses at the University of Mississippi, she took correspondence art courses from the Famous Artists School. These classes provided her with the skills to create a prodigious amount of art for the rest of her life. 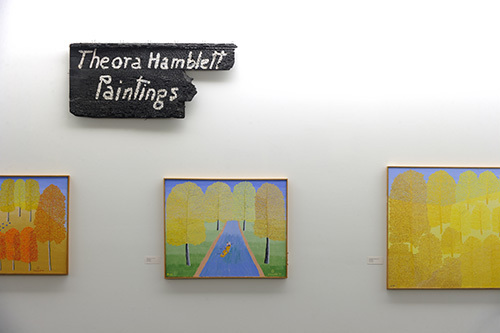 In 1954, a New York gallery owner named Betty Parsons purchased one of Hamblett’s paintings, which is now a part of the permanent collection at the Museum of Modern Art. 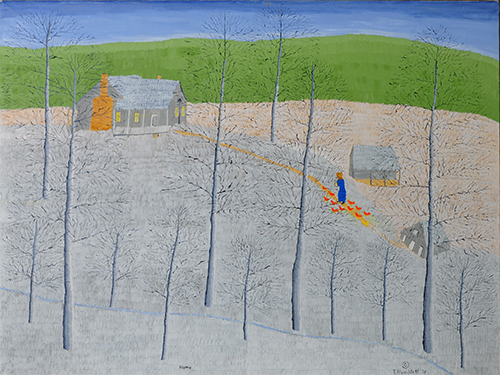 Many of Hamblett’s works concentrated on her childhood memories, especially growing up on the chicken farm in Paris. In nearly all of her landscape paintings, she includes animals or people; she believed those additions gave life to her paintings. 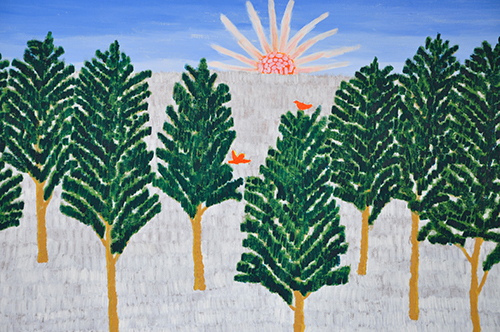 She painted many landscapes that featured children playing games. 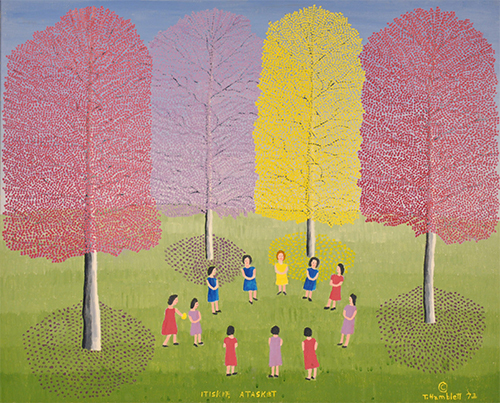 Many fans of the artist instantly recognize a Theora Hamblett painting by her unique style of creating trees. Her method of layering colors in the individual leaves shines with vibrant colors, each leaf being layered on to make the trees the focal point of the painting – as they appear to explode with color. 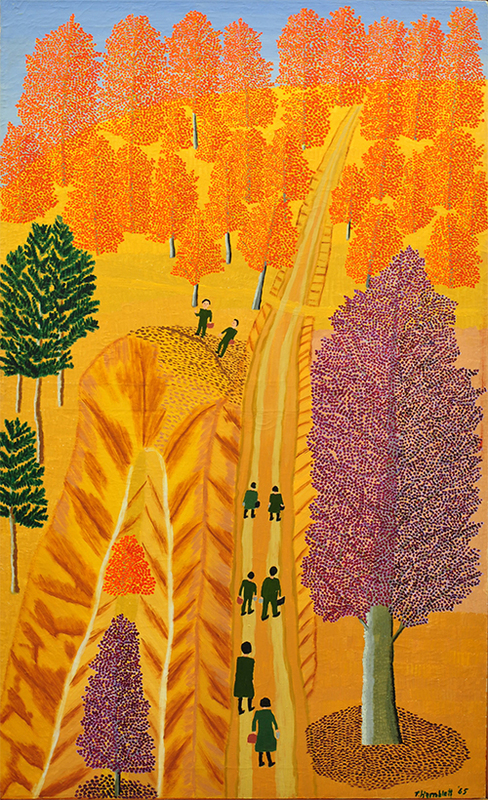 She painted scenes of all seasons, but was particularly fond of fall because of the brilliant colors of the leaves. 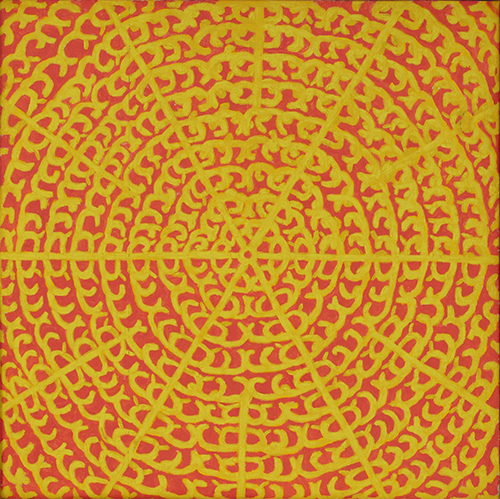 After an accident in 1954 that broke her hip and required surgery, Hamblett began to paint her dreams and visions. Many of her visions showed religious scenes, which she often painted in a series to tell a story. 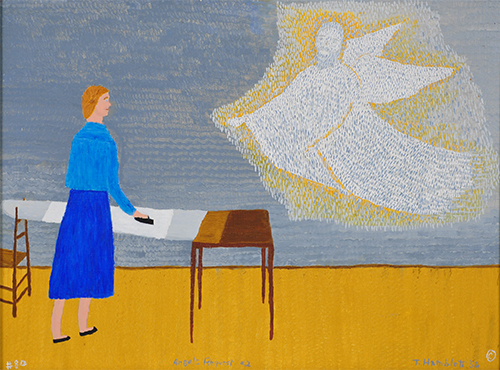 She sold very few of these paintings, as they were deeply personal and she believed to be a testament of her faith. 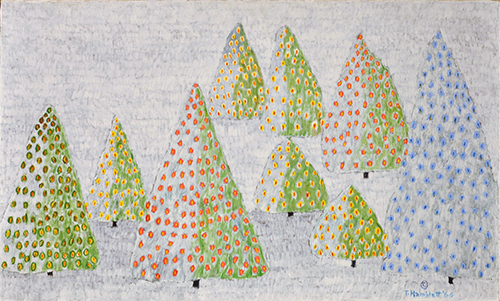 Upon her death in 1977, Hamblett willed nearly all of her paintings from Dreams and Visions collection to the University of Mississippi, along with a number of paintings from her Children’s Games and Old Home Memories collections. In addition to paintings, she also left glasswork and drawings to the University. 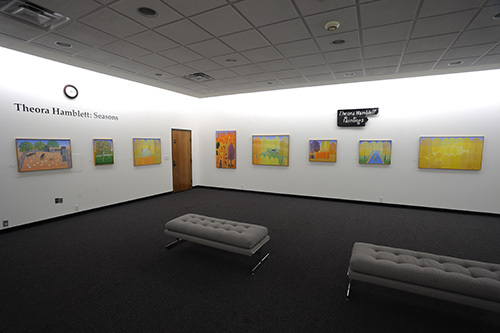 A selection of her works is often on display in the Museum. While private collectors and museums around the United States enjoy her paintings, the University of Mississippi has the largest collection of Hamblett’s work.